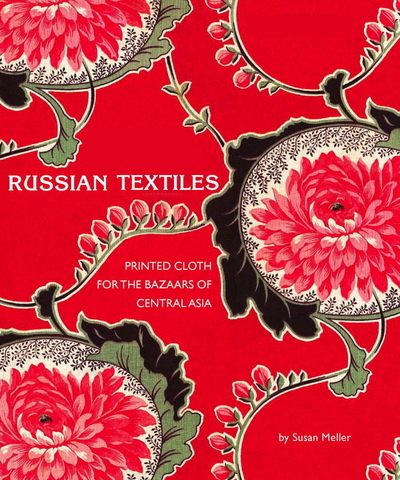 Browsing through one of my favourite magazines, Hand/Eye, I came across a marvellous interview with Susan Meller, founder of the Design Library and author of Russian Textiles: Printed Cloth for the Bazaars of Central Asia. This is a book you will treasure. The photography is outstanding and the research meticulous. In the 1870s patterns were used mostly for the lining of robes, and a decade later they started appearing more on the outside of the robes. 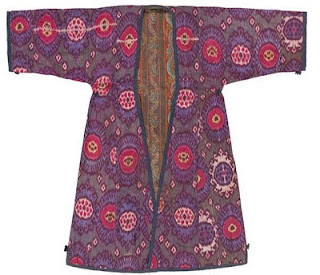 Sometimes three or four different patterns were sewn in blocks across the garment's front and sleeves creating beautiful juxtapositions of designs. The author explains that "by the 1880s, Russian mills were flooding Central Asian markets with inexpensive Turkey red cloth in brightly colored prints that were impossible to achieve by traditional woodblock methods. Bold colors were favored not only on imported fabrics, but in locally woven stripes, ikats and embroidered tent hangings. The vast barren steppes bloomed but briefly in the spring, deserts covered 60% of the land, and the towns were dust-covered and drab, save for the splendid tiles on the crumbling monuments of long ago. No wonder Central Asian nomads and city-dwellers alike craved color". A visit to Urgut's Sunday market, part of an Uzbek Journeys tour, provides a good chance of finding these pieces. Read the Hand/Eye interview.